Applications: 135 - 300 Hp / Gearcase: 4-3/4"
With Legacy, you can expect faster top end speeds, quicker hole shot, great lift, and secure handling even on tight WOT turns. 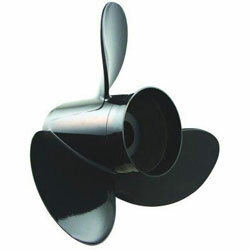 The best overall running aluminum propeller available! Turning Point has fine tuned their designs to maximize the total performance of your boat. Turning Point uses the same High Performance Stainless Steel blade patterns in their aluminum Hustler series, Legacy propellers incorporate a square hub design that is compatible with their MasterTORQUE Hub System as well as Michigan Wheel® s XHS® and Mercury® s Flo Torq® hubs. Now you can upgrade your propeller to a Legacy and not have to purchase a new hub! Higher RPM hole shots reduces planing times over OEM and other aftermarket propellers. Turning Point's High Performance stainless & aluminum propellers are also vented to further increase performance. The perfect RPM can be found with Turning Point's wide range of high performance pitch options. Take time to accurately tune in the optimal pitch & RPM for any application with the Prop Wizard.